Usually, you have to loosen the straps of a car seat when your child is wearing a bulky coat. This makes it easier to secure the strap, but the extra length in the straps makes the seat less safe. Coats, particularly bulky coats, should be taken off before you put your child in a car seat. You should keep children rear-facing in their car seats for as long as possible as this is the safest position. Experts say this should be until the child is over two years old. The middle seat is the safest seat in the car as it is less likely the child will get hit in a side-on collision. It is also less likely the child will hit their head on anything in a collision if they are sitting in the middle seat. If you are in an accident, and you are not wearing a seatbelt, you may be thrown around the inside of the car. 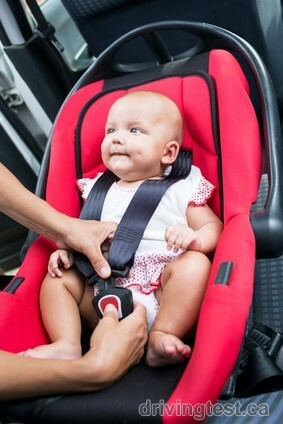 This could injure other passengers, including children in car seats, regardless of how securely and safely they are strapped in. You should also wear your seatbelt as a positive example to children. Car seats don’t last forever. In fact, there is an expiration date on car seats after which they are not safe to use. It depends on the manufacturer how long this is, but you will usually see a sticker on the car seat with the date. If there is no sticker on the child safety seat, and you have used it for several years (over five), it is better to replace it. Remember as well that you almost always have to replace a car seat after an accident, even if the accident is minor and there was no child in the seat at the time.